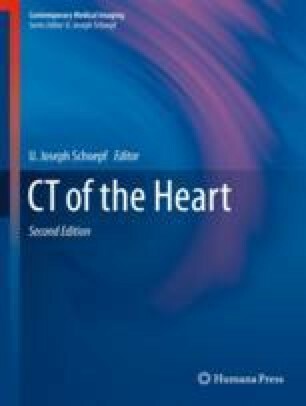 The ability of 3-D reconstruction has been a key element for the modern use of cardiovascular CT. Importantly, complex image reconstruction is performed by several users, including imaging specialist/radiologist and clinical interventionalist/surgeon. Imaging and image review/reconstruction are increasingly part of a stepwise decision-making process, transforming traditional single-observer reading and reporting to a process involving a team of interdisciplinary clinical specialists. This trend is observed in several subspecialties including oncology and cardiovascular medicine. These developments require a new level of data accessibility and performance of imaging systems, including ability to share data within large healthcare systems. It is supported by novel developments of IT architecture, allowing sharing of a centrally stored dataset between multiple peripheral workstations. Connection of scanners and workstations into a network or “cloud” with integration into the entire electronic health record (EHR) allows exchange of information across healthcare systems and supports multidisciplinary teams working on defined clinical workflows. These “cloud” systems are transforming clinical workflows, exemplified by the examples of acute aortic syndromes (AAS) and transcatheter aortic valve replacement (TAVR), where CT imaging has a central role. However, experience is limited, and further evaluation of the appropriate infrastructure including requirement for reliable patient identification between provider organizations and data safety is critical. Eventually the potential clinical impact needs to be evaluated in clinical trials. Drowning in big data? Reducing information technology complexities and costs for healthcare organizations. http://www.emc.com/collateral/analyst-reports/frost-sullivan-reducing-information-technology-complexities-ar.pdf.